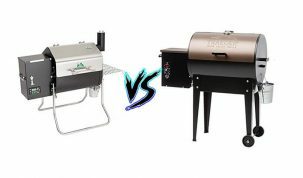 Finding the best charcoal smoker can be tough. There are a lot of considerations to take into account when buying one. 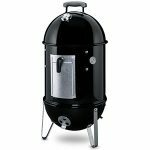 What type of charcoal smoker do you buy? What brand? And how much do you spend? We’ll answer all of these questions and more with detailed reviews, comparisons and rundowns in our best charcoal smoker under $300 buying guide. Charcoal is the fuel to use in a smoker if you’re to get that classic smoky flavor and smoke ring. It’s the classic fuel that has been around for as long as smoking has. This means that there are a lot of different types of smokers that use charcoal as their fuel. Bullet Smokers – There are vertical, cylindrical smokers that look like bullets. They’re great beginner smokers, customizable and work amazingly well. They tend to use water pans to help regulate the temperature and are sometimes called water smokers. Ugly Drum Smokers – These are sometimes homemade smokers, made from metal drums. They can be very cost efficient and are a great way to get into the hobby if you’re not looking to spend much, or any, money. They obviously won’t work as well as a professionally built smoker but are fantastic if you want to save some cash. A few companies have taken this design and created a dedicated product around the UDS idea. 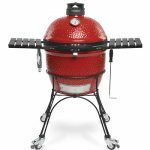 Kamado Smokers – Kamado Grills are a fantastically versatile way to cook outdoors. They are oval ovens, that sometimes look like eggs, that can grill, bake, roast and of course, smoke. If you’re looking for something more than a dedicated smoker then a Kamado is a great choice. Vertical Smokers – A vertical smoker is a smoker than stands vertically. (Obviously) The fire is lit at the bottom and then the smoke rises up through the smoker and cooks the meat on the way. The great thing about vertical smokers is that they can cook a lot of food at once. If you’re looking to cook for a lot of people, or just like to cook in bulk, then a vertical smoker is probably the way to go. Smoker Grills – These are typically grills that can slightly adapted to be used as smokers. They have the benefit of being fairly versatile and are usually quite cheap considering they’re just basic grills. 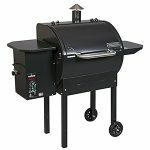 Offset Smokers – Offset smokers are the typical smoker you think of when classic BBQ smoking is mentioned. They are generally horizontal smokers that have a fire box on one side. The smoke and heat is pulled through the smoker from the fire box and that is how the food is heated. 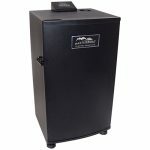 The higher end offset smokers are some of the best charcoal smokers available. Check out our full Weber Smokey Mountain Review. The Weber Smokey Mountain is one of the most popular and all-round best water smokers you can buy. It comes in three sizes. 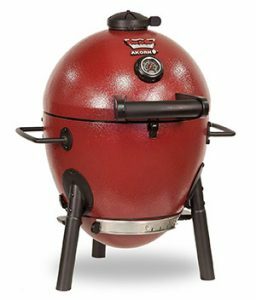 The diameter of the Weber Smokey Mountains can be 14 inches, 18 inches and 22 inches. We’re going to review the 18 inch model as that is within our budget. The 14 inch model has many of the same features as the 18 inch, but just lacks the same cooking area. The Weber Smokey Mountain (WSM) is made from porcelain enamelled steel which retains heat very well to make the smoking very consistent. This includes a water pan that is used to help regulate the temperature inside the WSM and helps with keeping the meat tender. It has 2 nickel plated cooking grates that give a total cooking area of 481 square inches. There are two dampers to allow a nice amount of control over the air flow and temperature. One of the best features of the WSM is the charcoal door that allows you to add flavored wood and charcoal incredibly easily. Heat shield to protect whatever the Smokey Mountain is standing on. Silicon grommet for your temperature probes to go through. Overall, the Weber Smokey Mountain is one of the best smokers you can buy. Beginners and veterans can easily cook up some of the best tasting food possible as easily as possible. It’s well made, has a lot of very nice features and is even covered by a 10 year warranty. If you’re looking for one of the best smokers, not just best charcoal smoker, then the WSM is just that. 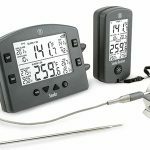 We recommend picking up a Weber Smokey Mountain temperature control system. 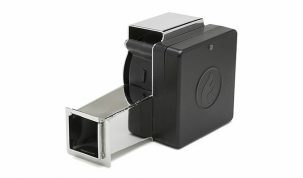 This allows you truly set it and forget it by automatically regulating the air flow for you. 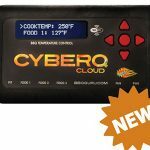 This will make smoking completely automated and can potentially save you a huge amount of time and effort. We recommend using the DigiQ DX2 Weber Smokey Mountain variant. This is a nice mid range option that will definitely make life easier. 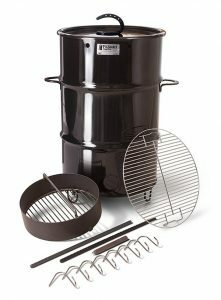 There are also a huge range of other Weber Smokey Mountain accessories. From rib racks to additional gasket seals we recommend having a browse and seeing if any accessories are for you. You get a cover with the WSM which is a nice accessory to have with the smoker as standard. Whilst it is possible to create your own ugly drum smoker, recently we’ve seen the rise of premade ones. The best of these is the Pit Barrel Cooker. The Pit Barrel Cooker takes the best parts of the UDS and refines them into a brilliant product that you can buy. The Pit Barrel Cooker is made up of a 30 gallon porcelain steel drum. It’s made of 18-gauge steel that is coated with porcelain enamel for added strength and durability, this also helps with containing the heat. You get high quality stainless steel grates, rods and hooks to allow you to grill or smoke a variety of different food in different ways. There is only a single air intake as the Pit Barrel Cooker regulates heat very evenly by itself. Comes fully assembled to save you the hassle of building the smoker. Surprisingly portable as it’s lightweight and can be set up anywhere. Can easily be used in very low ambient temperatures. Sturdy, rustic handles made from horse shoes. 240 square inches of cooking space. 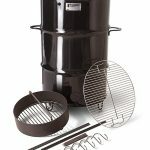 Overall, the Pit Barrel Cooker is a great option if you’re looking for a versatile, durable and very easy-to-use ugly drum smoker. It’s incredibly easy to light and keep going as the Pit Barrel Cooker pretty much regulates itself. It looks good and is well built. You’d can’t really expect much more for a smoker at this price point. 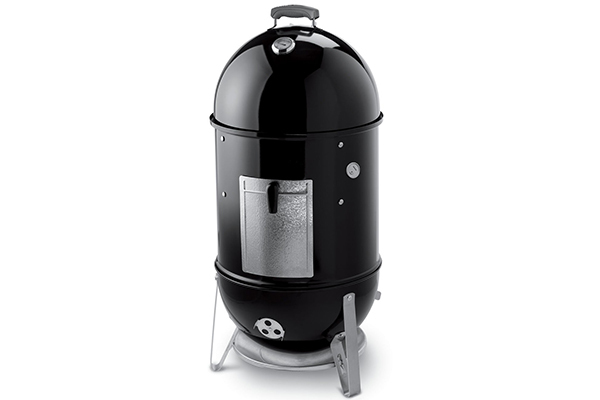 For everything you need to know, check out our full Pit Barrel Cooker review. We’re huge fans of Kamado grills here at King of the Coals. One of our favorite grills ever is the Kamado Joe. We love the versatility, the looks, and the amazing food that you can produce with relative ease. It’s just as easy to grill as it is to smoke or even bake a pizza. The Akorn Jr. is triple-walled insulated, steel built Kamado that is by far the cheapest Kamado on the market. Steel isn’t as good as ceramic at retaining heat but the Akron Jr. does a very good job considering its price. Its shell is made from 22-gauge steel and it can maintain cooking temperatures ranging from 200°F (93°C) – 700°F (371°C). The steel has a powder coated exterior and a porcelain coated steel interior finish which help it regulate the internal temperatures. You get an ash pan that makes cleaning up and disposal of ash very easy. There are also two adjustable dampers, one at the top and one at the bottom which allows you a lot of control over air flow and internal temperature. The Char-Griller Akorn Jr. is a great charcoal smoker for the price. It has a very simple assembly and you can be smoking very quickly. This is ideal for someone looking for a portable Kamado Grill that they can take camping or tailgating. We’d recommend something a bit bigger and better made if you’re looking for a quality home Kamado smoker. The Kamado Joe is almost perfect for this as we discuss in out review. If you’re looking to try Kamado smoking then we’d definitely recommend the Akorn Jr. It’s cheap and works very well. Overall, it’s definitely one of the best Kamados under $300 and therefore one of the best charcoal smokers under $300. What we love about vertical smokers is that you can smoke a lot of food in one go. As the smoke and heat rise up the smoker they can deliver the great smoky taste to whatever is in the stack, and in vertical smokers you can fit a lot in the stack. The Dyna-Glo 36” Vertical Charcoal Smoker has four adjust able cooking grates that can boast up to 784 square inches of cooking space! The adjustable racks and vertical design also allow a huge variation of foods to be cooked. In some smokers, it’s quite common to no be able to smoke a big turkey because the smoker is simply not big enough. That’s not the case with e Dyna-Glo. The adjustable racks can easily be taken out and moved around to allow you to cook whatever you want. So, the design is good but what about the build quality. At this price range you’re not going to get much better. The inside is covered in a porcelain enamelled layer to help hold in the heat, which it does fairly well. There have been reports of some smoke leakage, but this is to be expected for a smoker at under $200. Second door and ash pan for easy charcoal and ash management. 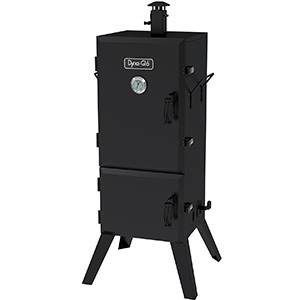 Overall, the Dyna-Glo DGX780BDC-D is as good as you’re going to get for a vertical smoker at this price range. You get a massive cooking area, it’s very easy to use and has some nice features that make it one of the best charcoal smokers available today. This section is dedicated to grills that can also be used as smokers. 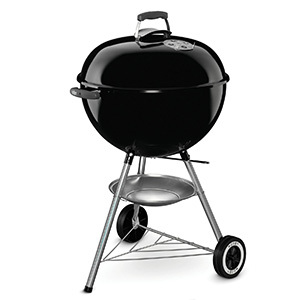 The Webber Kettle is one of the best selling and most popular grills ever. There are many sizes and colors that they come in, but we’ll look at the 22 inch model today. It boasts a 22 inch diameter steel cooking grate for a cooking area of 363 square inches. It has an aluminum bowl for catching ash and heat resistant nylon handles. The build quality is fantastic and the performance matches. There are multiple vents to allow a very versatile cooking system and two grill levels to change the heat that the food is subjected to. 2 convenient wheels that make movement a snap. Hinged cooking grate makes it easy to add briquettes. You won’t get a better standard grill than the Weber Kettle, but what makes it exceptional is that you can do so much with it. The fact that you can easily change it into a proper smoker that does a very respectable job at smoking is brilliant. You won’t get a better smoker for as little money as with the Weber Kettle. Here’s how to smoke with a Weber Kettle from the team over at Weber. The Weber Kettle also made it onto our list of the best charcoal grills under $200 dollars. There are also a huge range of mods that you can make to it if you choose. Because of the very cheap price point and simple design it’s easy to replace the handles or wheels to give your Weber Kettle a face lift. Or if you’re feeling more adventurous you can go as far as create your own rotisserie system. Here’s a selection of Weber Kettle mods that people have built. Smokenator – The Weber Kettle is a really good smoker as it is but the Smokenator accessory turns it into a brilliant smoker. 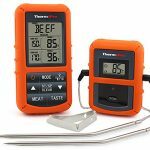 It makes smoking easier and more efficient and means you can make fantastic barbecue with very little effort. Slow ‘N Sear – The Slow ‘N Sear is similar to the Smokenator except it allows you to sear good as well. It turns your grill into a two zone cooker and works amazingly well. For more information read our in depth Slow ‘N Sear review. Weber Kettle Rotisserie – This turns the Weber Kettle into a brilliant rotisserie system. It build well and fells very durable with a heavy-duty electric motor to ensure smooth cooking. KettlePizza – If you’ve read around the site you’ll probably know that we’re huge fans of pizza. We’ve got an ultimate guide to buying a pizza oven to help you buy the best pizza oven for you. But if you already own, or are looking to buy a Weber Kettle, then the KettlePizza accessory might be for you. It turns the Weber Kettle into brilliant pizza oven. We generally wouldn’t recommend really cheap offset smokers. They tend to be poorly built, difficult to cook on and of a general low quality. We go into more detail in our best offset smoker guide. There are a few cheap offset smokers that might be worth your time though. The Char-Griller is a traditional offset smoker that uses a horizontal drum as the main cooking chamber. A nice feature of the Smokin Pro is that the side fire box can be taken off and used as a dedicated table top grill. 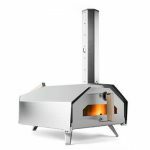 It uses good quality, powder-coated steel and has a massive cooking area of 830 square inches when including the side box. It has removable charcoal draws that allows you to add charcoal and dump ashes easily. Adjustable fire grate for additional temperature control. 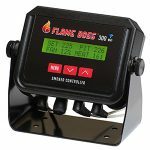 Built in thermometers that can give a basic temperature reading. Two shelves for multiple cooking options. We would recommend every other smoker on the list over the this one but where the Char-Griller Smokin Pro really comes into its own is the ability to mod it. 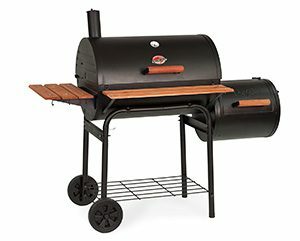 It has a very simple design and is perfect for some simple modifications to turn it into a brilliant offset smoker. If you’re looking for a new project then picking up a Char-Griller 1224 might be just what you’re looking for. You will get the best tasting barbecue with a charcoal smoker. The smoke from the charcoal and wood chunks, if you use them, will give the most authentic tasting food you can get. Charcoal is versatile and generally cheaper than other fuels. Can set it and forget quite easily. The use of an automatic temperature controller will make this even easier. Can come in huge sizes for maximum cooking area. Charcoal takes a little more work to start and maintain. Most smokers will be fine when maintaining them but will require a little more work to get started. 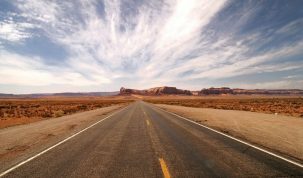 A chimney starter or electric starter can make this process much easier. There will generally be more mess and potentially dangerous clean up if you haven’t let the ashes cool properly. Some places simple don’t allow you to use charcoal grills or smokers. If this is the case for you then we’ve gone through the best electric smokers that are much more likely to be allowed in apartment complexes etc. Get good a lighting it. This is essential and can be made a lot easier with a chimney lighter or an electric lighter. Read through our guide to using a chimney starter to learn everything you need to know about starting your charcoal smoker. If you’re having trouble with keeping the temperature constant, then use an automatic temperature controller. Also, always remember to use a digital thermometer as the built in thermometers are never very accurate. We recommend using lump charcoal instead of briquettes. This is because they tend to burn cleaner and are completely natural. We’ve taken a look at the differences of lump charcoal vs briquettes here. Remember to replace any evaporated liquid in the water pan. (If your smoker has a water pan). Don’t let the water pan run completely dry as the temperature will shoot up. When adding charcoal or lumps of wood use tongs to carefully place them on the hot coals. There is no need to stir the coals or place the charcoal deep in the hot coals. Use our smoking times and temperature chart to make sure your food is cooked to perfection. Make sure you season your new smoker correctly using our seasoning guide. 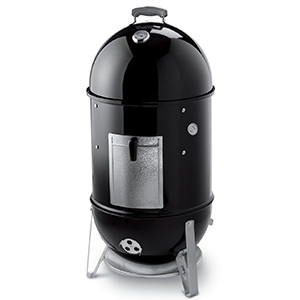 Charcoal smokers are a great option to get into smoking. They are cheap and easy to use and give some of the best flavor you can imagine. If you have any questions then please write them in the comments below.